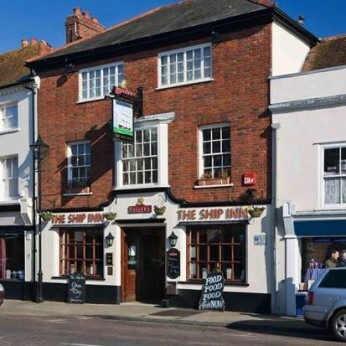 The Ship Inn is a popular, lively pub in the centre of Emsworth. Well-kept ales and lagers are complemented by traditional pub food at lunchtimes, while evenings herald a buzzing atmosphere and some friendly competition at the pool table. For a satisfying lunch, washed down with a cracking real ale, get on board at The Ship. Great home cooked food is served between 11am and 3pm seven days a week. The Ship Inn boasts an attractive courtyard garden, perfect for an al fresco ale or two! And thanks to our outdoor space, we're able to welcome pets. Every day from 11am, our talented chefs rustle up sumptuous snacks and luscious lunches from the kitchen. Stop by for great home-cooked food seven days a week.